Thank you for participating in Jaime's fun Christmas Card and Gift Bloghop. I'll be showing you a box gift and poem I created, just perfect for those little gifts you like to give teachers' aides, card partners, cookie swappers, etc. They're easy to make and not too expensive to do. First, I cut the "crayon box" using Cricut's "Tags, Bags, Boxes and More" cartridge. Press the "black-out" feature otherwise you'll get holes in the upper part of each side of the box. Score and assemble the box. I adapted and wrote a portion of the poem I used ... feel free to "lift" it without attribution. 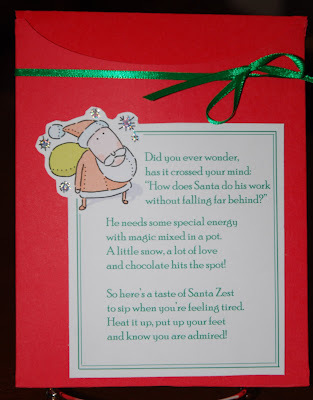 I created a layout for the poem and a bit of free Click Art (Santa) on cardstock and fussy-cut the Santa around the corner. I embellished Santa's snowflakes using Stickles, and adorned the whole lot with ribbon. Inside, I stocked the "Santa Zest" with a package of hot chocolate mix, a little baggie with marshmallows and large chocolate chips, and a peppermint candy stick for stirring. with magic mixed in a pot. and chocolate hits the spot. to sip when you're feeling tired. and know you are admired! 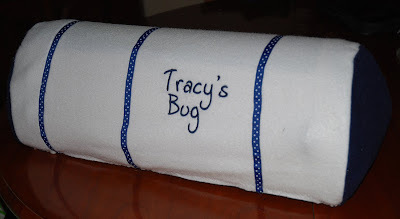 You pick the color of the lettering and background fabric color, and specify whether you need a Cricut Expression or Baby Bug cover. 1. Be (or become) a follower of this blog, at cardmonkey-business.blogspot.com. 2. Leave a comment to this post. 3. For an additional chance, add a comment to any of the "older posts" shown on this blog. by clicking this link just above. This looks yummy, and I love the poem! Your candy seems very special, hand-made and comes from the heart. What an adorable idea. Already a follower.Super dooper cute. This is a great project. Would love to win the cover. This is such a cute idea. I'm already a follower. Great project! I'm a follower. 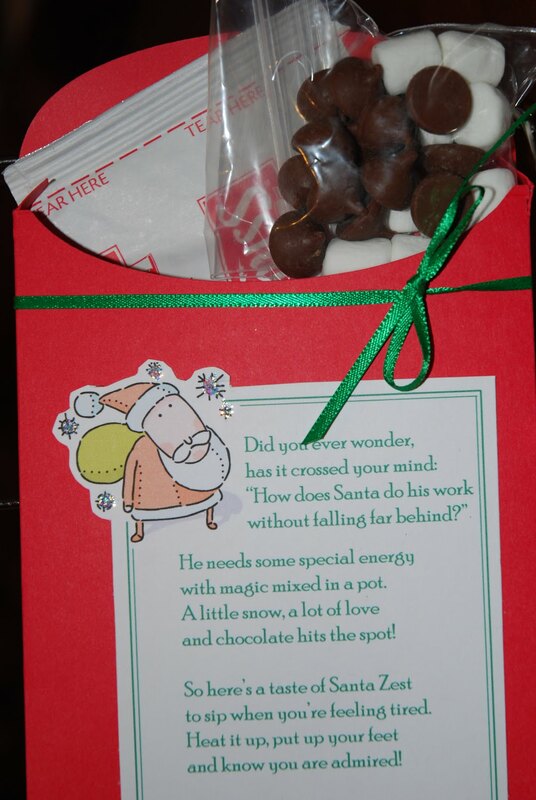 The hot chocolate care package is such a sweet idea. Even the toppings. Enough to make anyone feel special. What a cute and clever project! Adorable! I'm a follower. Thank you all for your kind comments. I'm done hopping for today .. going to go get a bagel and hot chocolate! Love it! So cute! The poem is adorable too! TFS! This is so cute! I love the cricut cover!! This is a very sweet idea. Thanks for sharing and the chance to win a wonderful cricut dust cover (although I never get it closed up long enough to cover). I am a follower. This is nice for a teacher--the get so much "stuff." Now here is a little treat that they can keep around just for the season. What a cute project and beautiful bug cover. Thanks for sharing. I liked the poem and the gift box - very cute gift. I also became a follower of your blog. This is such a neat idea. I've always wanted to cut out the "crayon box" in TBBM.. just never had a reason to. lol (now I do) I'm a new follower. Thanks for a chance to win! Happy Holidays! What a cute, nifty little idea!!! I will have to keep it in mind for school gifts and such! Very cute.. Thanks for sharing.. im a new follower.. 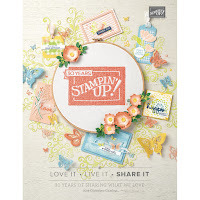 I would love to win a cover for my cricut.. Such a sweet and creative project!!! Love the poem and thanks for the lift of it. I am an old follower. Great giveaway. Thanks for the chance to win. Great project, love the poem!! oh my! I would love to win a cover fr my expression! I love the gift box and the poem is too cute! I love the crayon box and the poem too. I am now a follower and will visit often. I also commented on your partridge. It's pretty. This is so great! That poem is awesome...you did a fantastic job! TFS! Super cute! What a great idea I love it! So cute and thanks for the poem! How nice of you to offer up another Cricut cover! Crossing my fingers and toes again! Awesome project and that cover is great!! dear Santa...TFS!! What a great idea. The poem is perfect. I can think of several people to make on of these for. How cute! Love the poem! Wow, such a great poem, I am for sure going to lift this one. I will make it for my grandkids to leave for Santa this year. TFS such a great ideal! How cute is this?! I love the poem and the whole package! :) Great job! Btw-I love your covers and would be honored to win one! VERY ADORABLE BOX! LIKE THE POEM!! LEFT A COMMENT ON AN OLDER POST! LOL I've seen the snowman poop and reindeer food but not Santa zest! Too cute! TFS! Oh my gosh! This is absolutely too cute for words. 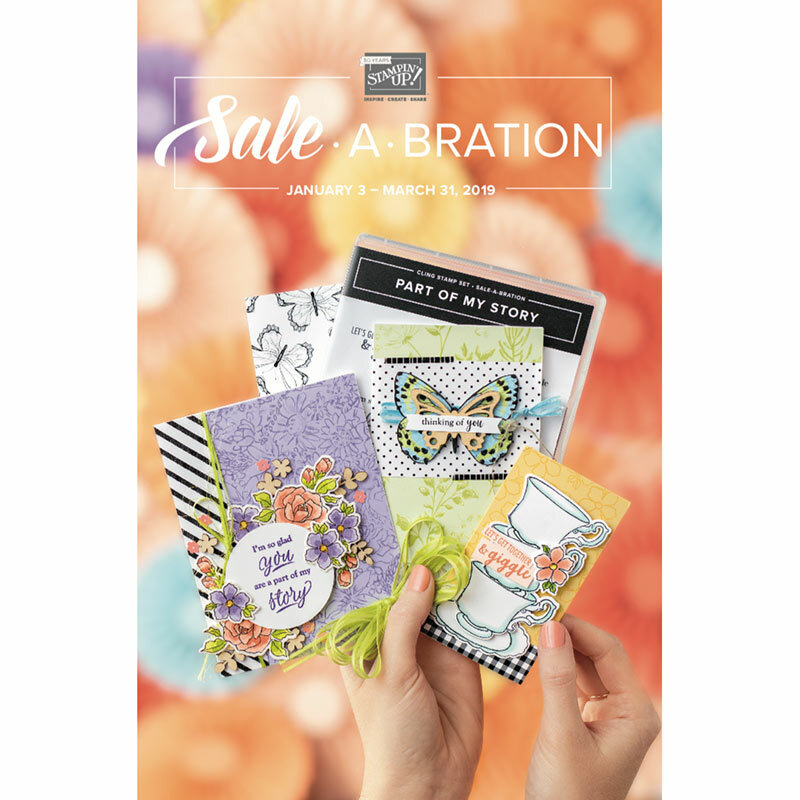 This is the perfect teacher gift! Thank you! I love this! and the poem is too cute! I am a follower and love your project. It is super cute. Thanks for sharing!!! Your project was lovely and I enjoyed the poem! TFS! I am also in a hop and if you like come hop on by. What a sweet poem. Thanks for the great idea. Cute!!! Good idea! Already a follower! Just couldn't hit all the blogs this weekend!